And picking up my tapestry and sewing needles. 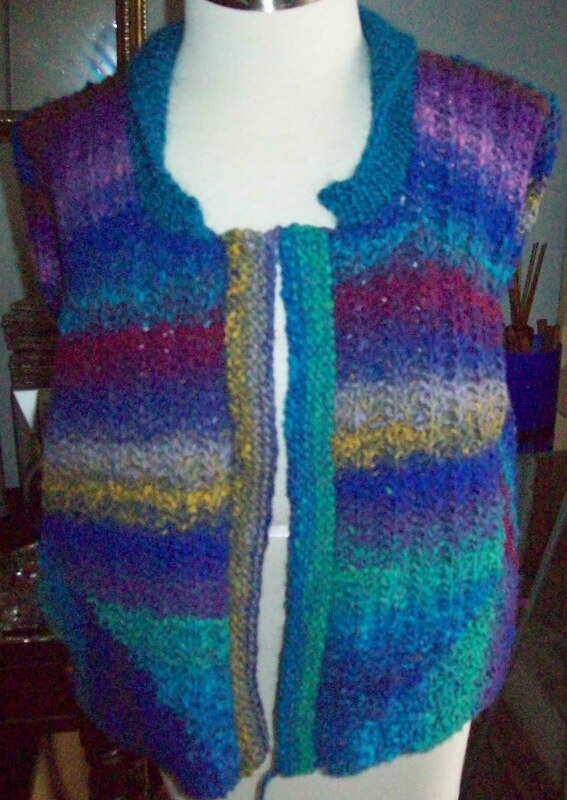 The Noro Vest is Knit.. meh. It's OK.
Its warm, it functions. It's OK but it doesn't send me. Beautiful colors, OK yarn, so so finished object. And it still needs some I-cords and finishing. I ended up, after the front bands, with about 2 yards of the Noro left over. A bit of good luck. LOT'S of things need finishing, too Some just a thread or two to be woven in, some—several hours worth (snaps, embelishment, trim). So while there will be some little knitting (a bunch of very small projects needed by the end of the month)-- For the most part, for the next few days, the work of the day will be one of finishing up—weaving in ends, making a pompom or two, and what not. Turning a bunch of ALMOST done stuff into actual FO's. Then Socks! I have a week to finish --a bunch of stuff-- (and I don't think it will take that long) and then a week and few days to make a pair of socks. Not that I have to knit a pair of sock every month--it's just sort of a goal (a want to). Oh yeah, hats! I need to knit some simple hats for a charity project (I have done 3—but well I need to do more) And, and , and—there are always more things I want to knit, I need to knit. There is always yarn, and ideas, and knitting!